The short version of the story is that Democrats flipped fully 29% of the Republican seats up in the last year or so, while Republicans flipped only 6%. A similar result in the US House would net 58 seats – easily enough to flip the chamber. What, if anything, do the special elections tell us about how the country has shifted, and what's going to happen in November? There's a big enough sample of special elections, that we can dig in a bit to see how one differs from another. But we need a clean sample. "Battle Royales" which pit 4 or 5 candidates from different parties are going to have a very skewed dynamics. If they end up in a 2-party runoff, then it makes my list. Likewise, if the race has been uncontested for the last several cycles (since 2012) then I'm not interested. After scrubbing all of the data, I'm down to about half the races – 59 out of 124 which fit the bill. The Trump Effect is large -- enough to flip the House -- but any given election has a large scatter. 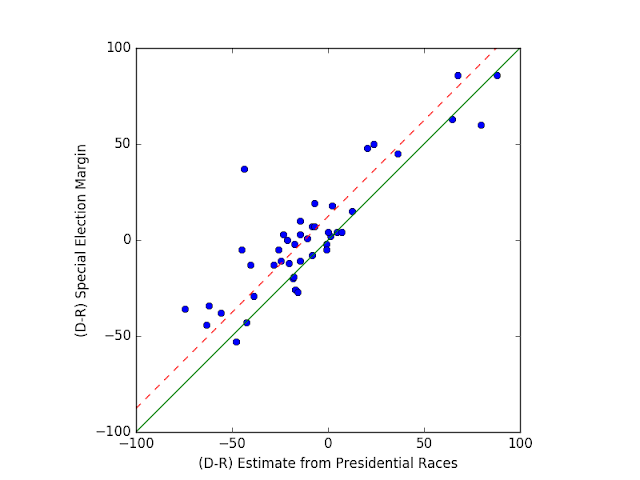 Hence, a handful of races were actually a little better for Republicans than expected. We don't need particularly fancy analyses to come to the same conclusions. This result is consistent with those found over at Daily Kos, 538, and the Washington Post (and many other outlets), which all find a 10 or 15 point overperformance by the Dems at the state level, and an 18 point overperformance for Dems with national races (15 points if you throw out the Alabama Senate race as an anomaly). 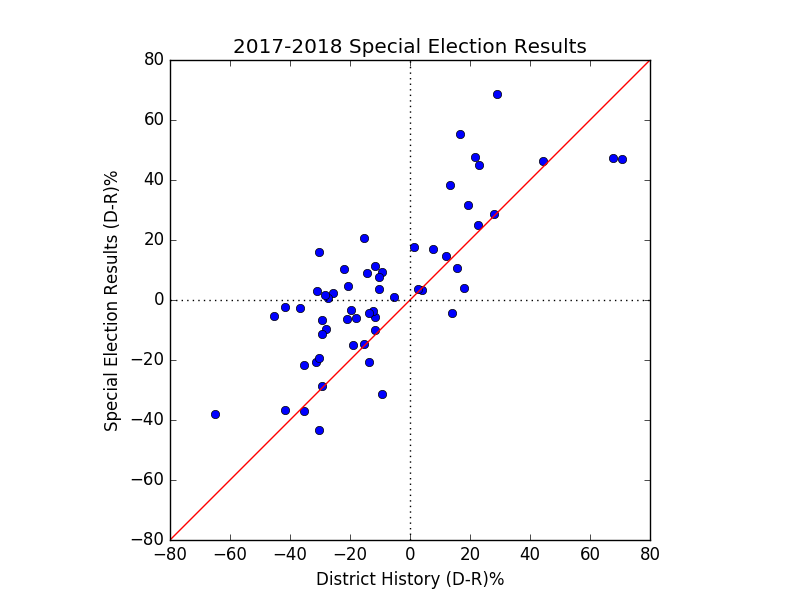 Not only are the mean of all of the districts which have had competitive special elections essentially identical (about -8% Republican by both metrics), the correlation coefficient between them is 0.84, meaning that they are (except for noise) essentially proxies for one another. 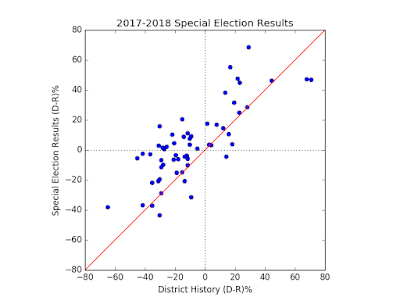 By taking a simple average, we significantly reduce the underlying "scatter" in each district (basically, our uncertainty in what a neutral year would look like goes from 11.2% to 7.9%). Now that we've got a clean sample with smaller underlying errors, we can try to get to the heart of what these races mean. Here's a hypothesis: Maybe the Dems are overperforming because (contrary to history and conventional wisdom) there is a small group of them who would normally only vote in November elections, but are voting now. If this were the case, special elections mean nothing predictive, because we're not activating any "extra" voters. 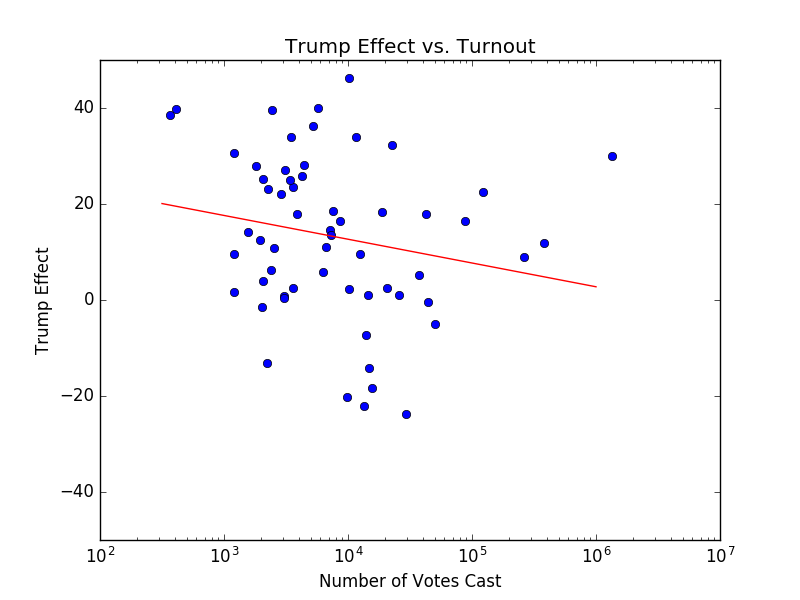 We could test this by looking at the Trump Effect (Dem overperformance) as a function of voter turnout. 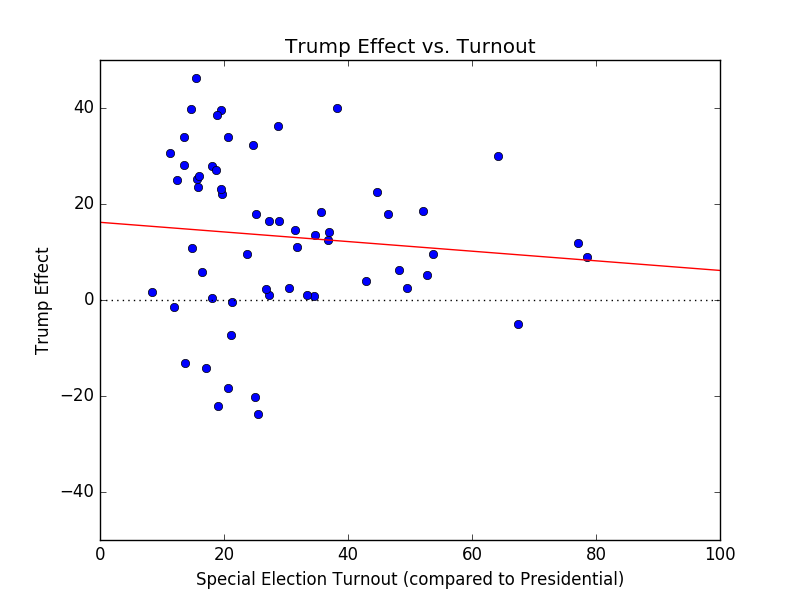 If there's a gap of superenthusiastic voters (but not likely November voters), then we'd expect that the greater the turnout, the smaller the Trump effect. As total voter registration numbers is tough to come by, I'm going to compare the turnout in the special to the 2016 voter turnout. The results are... inconclusive, to say the least. 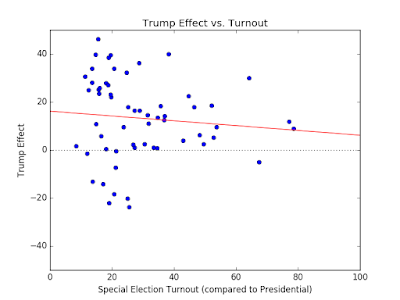 As the red line indicates, the best fit does, indeed, support the idea that at higher turnout, the Dem advantage grows smaller (16% advantage at low turnout, 6% at "full" turnout), but the error is very large. Including errorbars, the best fit for the slope is $-0.1\pm 0.14$, meaning that the true turnout effect could very well be zero. Or it could be enough to erase the Trump Effect entirely. That's how science goes, I'm afraid. 2. Does National Impact of the Race Matter? where the slope, $m=-5\pm 3.3$. 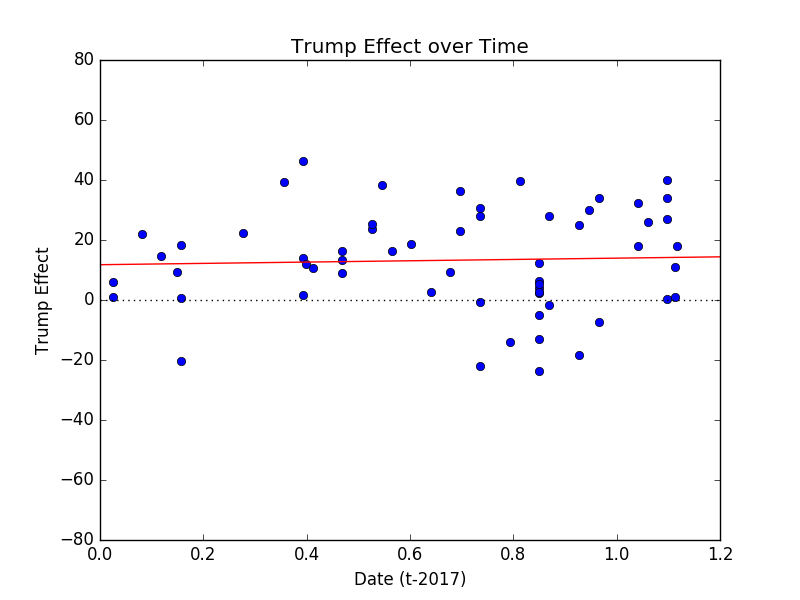 In other words, there seems to be pretty strong evidence that larger are, on the whole, closer to a smaller Trump Effect. But if we're going to look at the effect on the micro-scale, I think we're likely dominated by a few 40 point shifts in very, very low turnout races. As a case in point, earlier this month, Missouri's HD39 had a swing of 34 points based on fewer than 3500 votes. This may be one of those cases where trying to force a model may not be worth it. 3. Is there simply a reversion to the mean? Next hypothesis: Maybe Dems are doing well because, as it happens, most of the contested races are Republican seats. If that's the case, then we've got nothing but a reversion to the mean. If that's the case, then the more "Republican" the district, the greater the Trump Effect. 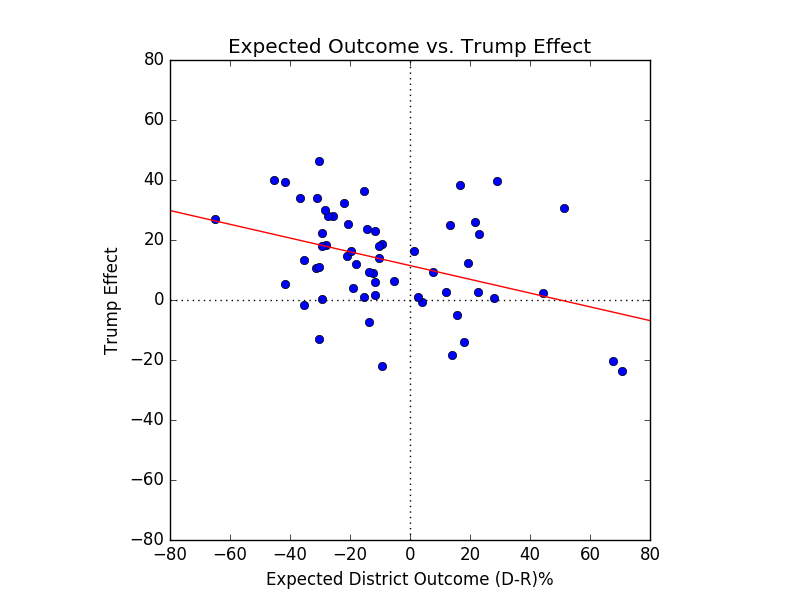 For every 10% more Democractic the district, the Trump Effect decreases by 2.2%, and this is a $3\sigma$ result – very robust. 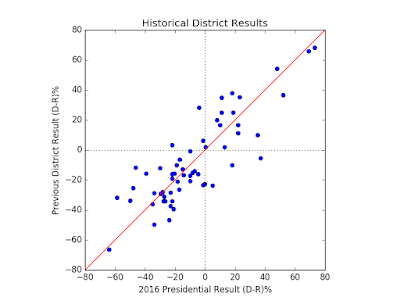 The good news for the Dems is that you only need a Trump Effect in moderately Republican districts. Indeed, this means that there are more districts within striking range than you might naively have guessed. 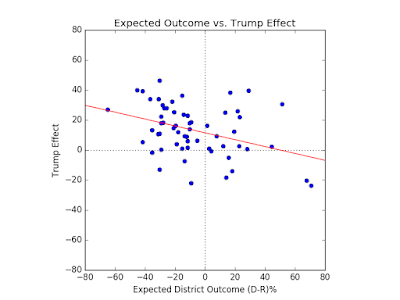 Though the Trump Effect for a neutral district is about 11.5%, for a D-R=-15 district, the effect is 15 points – which means 15 point Republican districts are winnable. Want to know how many House Districts Trump lost or won by fewer than 15? 285. Result: Significant, and in a good direction! 4. Is the Trump Effect getting larger or smaller? There's been a lot of panic lately about the tightening of various polls, so here's a quick hypothesis: The polls are tightening because the enthusiasm gap and the actual preference gap are tightening. 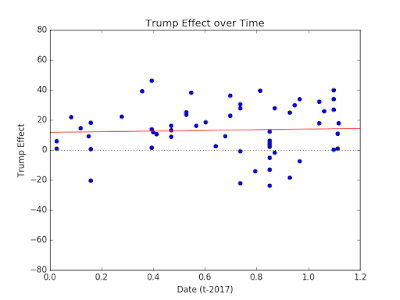 The good news: the Trump Effect seems to be pretty flat over time. 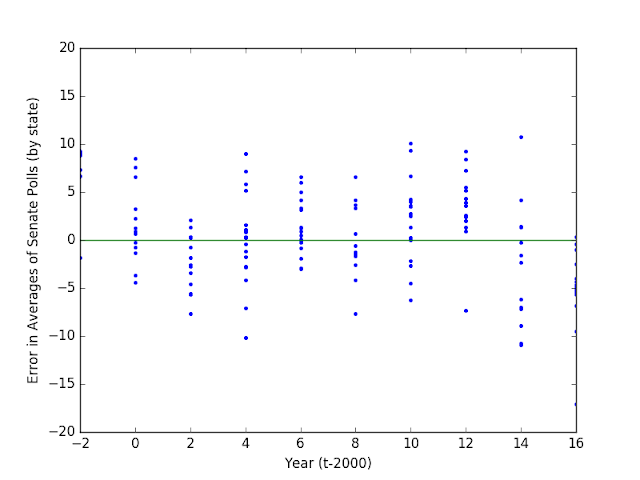 Indeed, the best fit to the slope is $2\%/year \pm 7\%$ (which is a fancy way of saying "totally consistent with flat.") But still, you'd rather an upward slope than a downward one. Result: Likely nothing, but if not flat, then pointed nominally in the right direction. None. 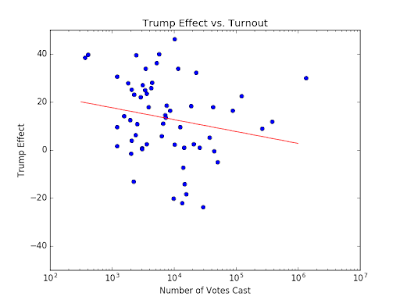 There seems to be no strong long-term trend, and while high turnout races tend to have a lower Trump Effect, the result is small and the errorbars are large. 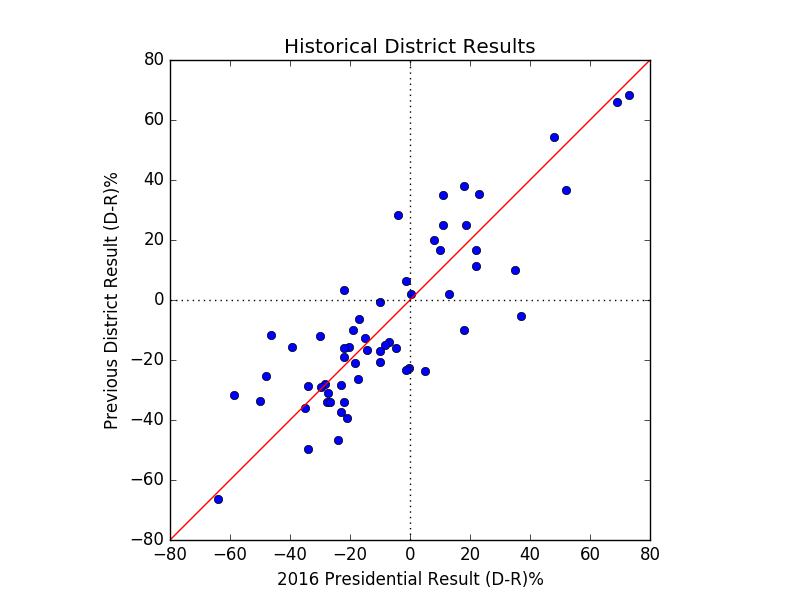 The biggest single effect (and one cause for optimism) is that Dems seem to be particularly overperforming in highly Republican districts. This is great, if it holds, because it means that we're actually underestimating the blue wave.